Ideas can strike at any time. Hot-water cooling will come closer to the mainstream at next week’s ISC event in Frankfurt, Germany, but the birth of the idea came a long time before that. In 2006, Dr Bruno Michel was at a conference in London, watching former head of IBM UK Sir Anthony Cleaver give a speech about data centers. At the end, attendees were told that there would be no time for questions because Cleaver had to rush off to see the British prime minister. “He had to explain to Tony Blair a report by Nicholas Stern,” said Michel, head of IBM Zürich Research Laboratory’s Advanced Thermal Packaging Group. The Stern Review, one of the largest and most influential reports on the effects of climate change on the world economy, painted a bleak picture of a difficult future if governments and businesses did not radically reduce greenhouse gas emissions. “We didn’t start the day thinking about this, of course,” Michel said in an interview with DCD. 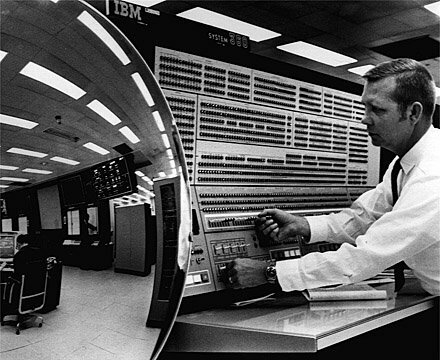 IBM’s history with water cooling dates all the way back to 1964, and the System/360 Model 91. Over the following decades, the company and the industry as a whole experimented with hybrid air-to-water and indirect water cooling systems, but in mainstream data centers, energy-hungry conventional air conditioning systems persisted. “We wanted to change that,” Michel told us. His team found that hot water cooling, also called warm water cooling, was able to keep transistors below the crucial 85°C (185°F) mark. Unlike most water cooling methods, the water is brought directly to the chip, and does not need to be cooled. 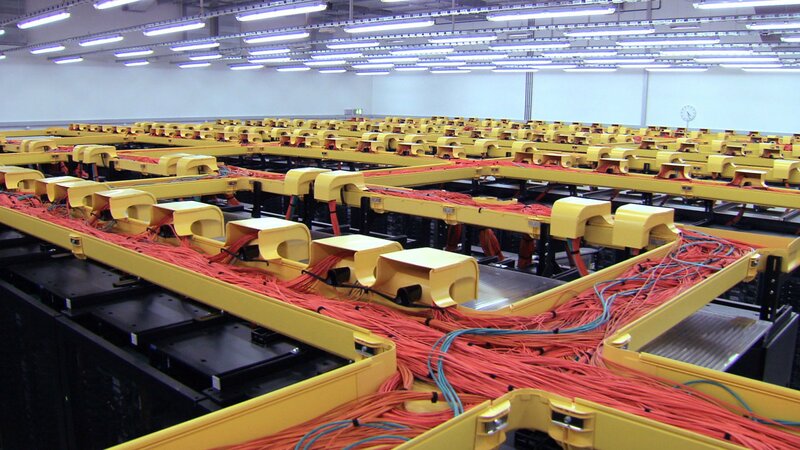 This saves energy costs but requires more expensive piping, and can limit one’s flexibility in server design. By 2010, IBM created a prototype product called Aquasar, installed at the Swiss Federal Institute of Technology in Zürich and designed in collaboration with the university and Professor Dimos Poulikakos. “This [idea] was so convincing that it was then rebuilt as a large data center in Munich - the SuperMUC, in 2012,” Michel said. 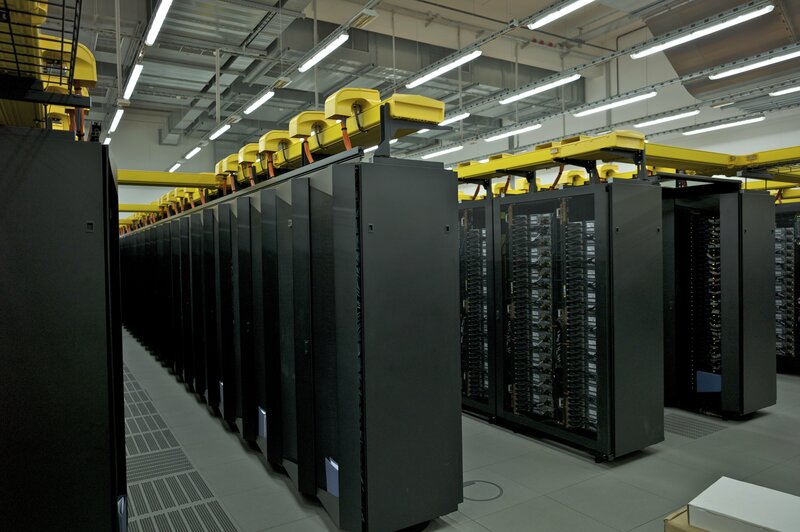 SuperMUC at the Leibniz Supercomputing Centre (LRZ) was built with iDataPlex Direct Water Cooled dx360 M4 servers, comprising more than 150,000 cores to provide a peak performance of up to three petaflops, making it Europe’s fastest supercomputer at the time. “It really is an impressive setting,” Michel said. “When we first came up with hot water cooling they said it will never work. They said you’re going to flood the data center. Your transistors will be less efficient, your failure rate will be at least twice as high… We never flooded the data center. We had no single board leaking out of the 20,000 because we tested it with compressed nitrogen gas. The system was the first of its kind, made possible because the German government had mandated a long-term total cost of ownership bid, which meant that energy and water costs were taken into account. As a closed system running with the same water for five years, the water cost was almost zero after the initial installation. 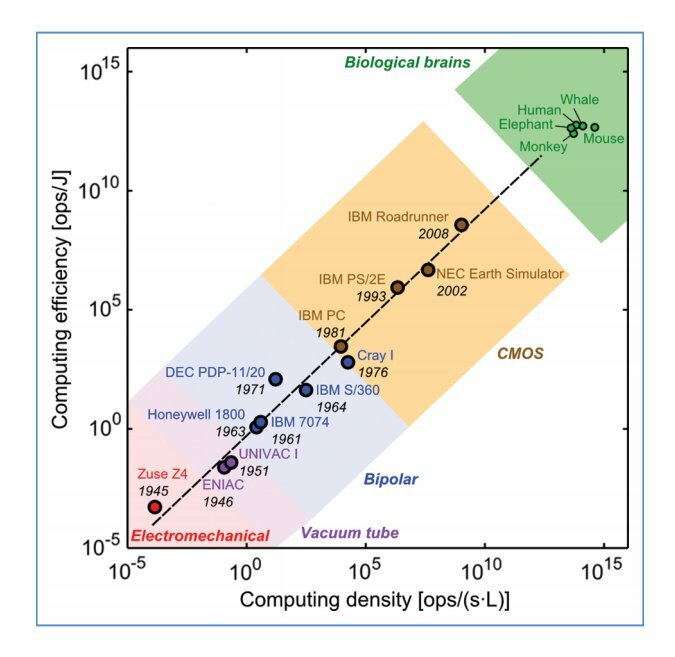 The concept is yet to find mass market appeal, but “all the systems in the top ten of the Top500 list of the world’s fastest supercomputers are using some form of hot water cooling,” Michel said. There are signs that the technology may be finally ready to spread further: “We did see a big change in interest in the last 18 months,” said Martin Hiegl, who was IBM’s HPC manager in central Europe at the time of the first SuperMUC. Hiegl, along with the SuperMUC contract and most of the related technology, moved to Lenovo in 2015, after the company acquired IBM’s System x division for $2.3 billion. “There are more and more industrial clients that want to talk about this,” Hiegl, now business unit director for HPC and AI at Lenovo, told DCD. With hot water cooling, Lenovo has been able to push the envelope on modern CPUs’ thermal design point (TDP) - the maximum amount of heat generated by a chip that the cooling system can dissipate. 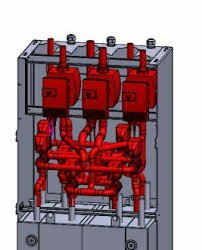 Hot water cooling has also found more success in Japan “as there’s a big push for those technologies because of all the power limitations they have there,” as well as places like Saudi Arabia where the high ambient temperatures have made hot water a more attractive proposition. 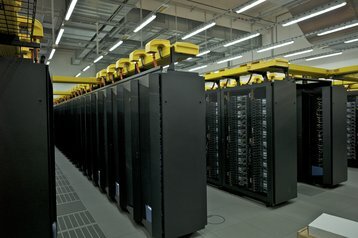 Meanwhile under Lenovo, the SuperMUC supercomputer is undergoing a massive upgrade - the next generation SuperMUC-NG, set to launch later this year, will deliver 26.7 petaflop compute capacity, powered by nearly 6,500 ThinkSystem SD650 nodes - now set to be commercialized for the mainstream data center as Neptune. 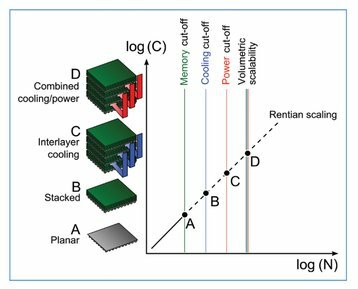 As power densities continued to rise, Lenovo encountered another cooling challenge - memory. “DIMMs didn’t generate that much heat back in 2012, so it was sufficient to have passive heat pipes going back and forth to the actual water loop,” Hiegl said. The company has also explored other ways of maximizing cooling efficiency: “We take hot water coming out of it that’s 55-56°C (131-133°F), and we put it into an adsorption chiller,” which uses a zeolite material to “generate coolness out of that heat, with which we cool the whole storage, the power supplies, networking and all the components that we can’t use direct water cooling on,” Hiegl said. The adsorption chiller Lenovo uses is supplied by Fahrenheit, a German startup previously known as SolTech. 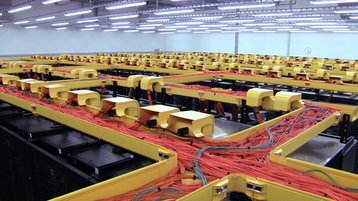 “We’re the only people in the data center space working with them so far,” Hiegl added. The Defense Advanced Research Projects Agency’s Intrachip/Interchip Enhanced Cooling (ICECool) project was awarded to IBM in 2013. 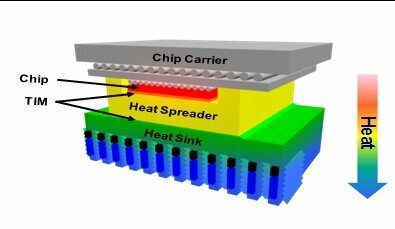 The company, and the Georgia Institute of Technology, are hoping to develop a way of cooling high-density 3D chip stacks, with actual products expected to appear in commercial and military applications as soon as this year. “It is not single phase, it’s two phase cooling, using a benign refrigerant that boils at 30-50°C (86-122°F) and the advantage is you can use the latent heat,” Michel said. “You have to handle large volumes of steam, and that’s a challenge. But with this, the maximum power we can remove is about one kilowatt per square centimeter. 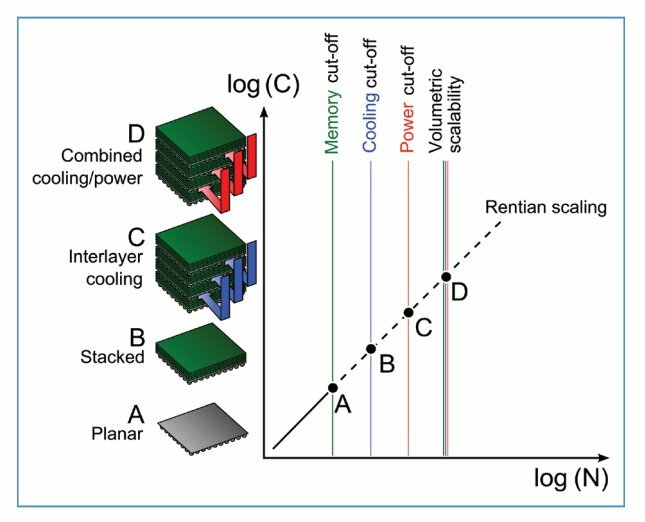 In a separate project, Michel hopes to be able to radically shrink the size of supercomputers: “We can increase the efficiency of a computer about 5,000 times using the same seamless transistors that we build now, because the vast majority of energy in a computer is not used for computation but for moving data around in a computer. “Any HPC data center, including SuperMUC, is a pile of PCs - currently everybody uses the PC design,” Michel said. “The PC design when it was first done was a well-balanced system, it consumed about half the energy for computation and half for moving data because it had single clock access, mainboards were very small, and things like that. This has meant that “you have to use cache because your main memory is too far away,” Michel said. “You use command coding pipelines, you use speculative execution, and all of that requires this 99 percent of transistors. However, Michel admitted to DCD that the road ahead will be difficult because few are willing to take on the risks and long-term costs associated with building and deploying radically new technologies that could upend existing norms. The Stern Review led to little change, its calls for a new approach ignored. “Then we had the Paris Agreement, but again nothing happened,” he said. In 2012, the Dutch government launched the DOME project - a joint partnership between IBM and ASTRON, the Netherlands Institute for Radio Astronomy - to design computing technology for the Square Kilometre Array (SKA), the world’s largest planned radio telescope. Building upon the hot water cooling technology in SuperMUC, DOME lead to the creation of IBM Zurich’s MicroDataCenter, a computational dense, and energy efficient 64-bit computer design based on commodity components. But with IBM mostly out of the low-cost server market, it is currently licensing out the technology, with the first company utilizing the product coming from The Netherlands. ILA microservers, a startup, offers variations on the hot water cooled server.